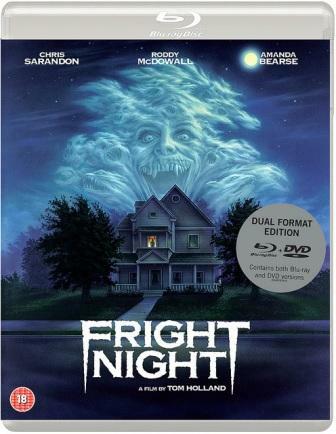 Eureka Entertainment has released Tom Holland’s directorial debut FRIGHT NIGHT, the iconic 1980s vampire classic starring Chris Sarandon, William Ragsdale and Roddy McDowall, for the first time on Blu-ray in the UK, in a Limited Edition Dual-Format SteelBook and a Special Dual-Format Edition will be released on 10th April 2017. I have watched Fright Night a few times in the past, usually around Halloween, but until recently I hadn't seen it in quite a few years. It was so fun to revisit this classic once again! It's one of those films that you can see multiple times and it's still so entertaining. I love a good scary movie! Fright Night stars Chris Sarandon as seductive vampire Jerry, alongside William Ragsdale as Charley, a teenaged neighbour who is frightened by what he sees next door. Charley knows Jerry's secret, but he can't get anyone to believe him. During Charley's quest to find help, he enlists the help of TV horror host Peter Vincent, played by Roddy McDowall. Peter Vincent has been known as the "Great Vampire Killer" during his movie career, so Charley imagines that Peter will have some insight into how to handle a real vampire. Charley's girlfriend Amy (Amanda Bearse) and his friend Evil Ed come along with him on his quest to save everyone from Jerry's bloodsucking ways. This is a fun film and it's one of my favourites. There's humor as well as good spooky fun to be found here. If you love a bit of classic horror, then this is the perfect one for a weekend movie night or any night! Disclosure: I was sent a copy of this film for review. All opinions are my own.